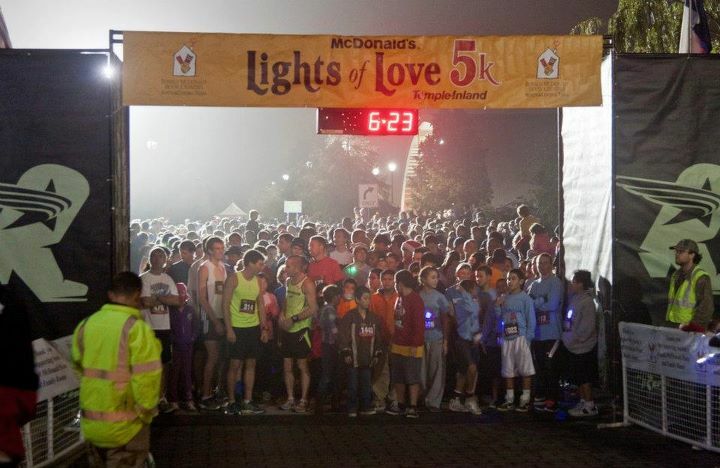 Friday night marked our final race of 2011 – the Lights of Love 5K benefitting the Ronald McDonald House here in Austin. 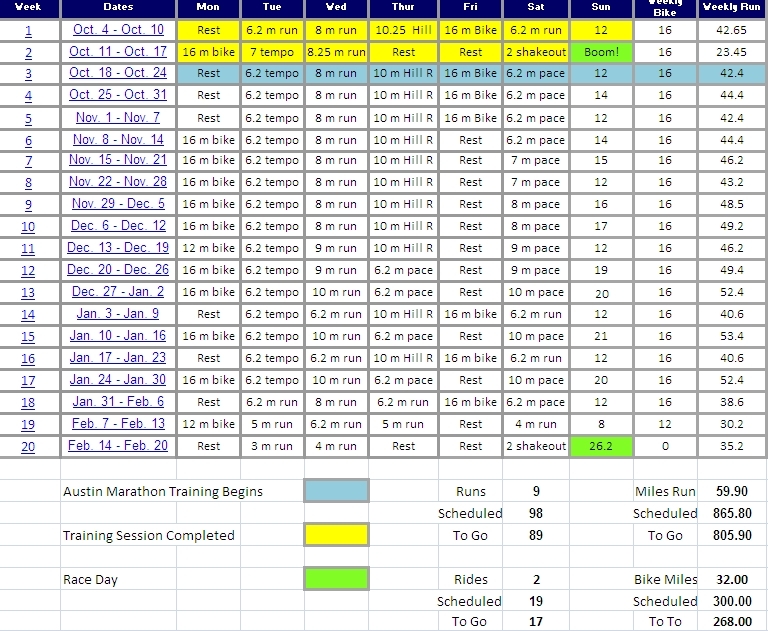 It’s a funny thing when you lay out all of your plans for races and events at the start of the year, you tend to focus on the “big” events and not so much the smaller ones. In 2011 I had the Livestrong Austin Marathon in February, my first Triathlon in July and the New York City Marathon in November as the marquee events for the year. Those events were in fact tremendous experiences – but they were only a small part of our 22-race calendar for 2011. Many races, like Lights of Love, Jaylie.org, Denver Half-Marathon, the SI Labs Marathon Relay, The Austin Triathlon all were events that just kind of “happened” during the course of the year. When I look back on that list, they include some of my favorite memories from 2011. They were all truly gifts and I was fortunate to be able to participate in them. That said, the Lights of Love race takes all of that to another level. 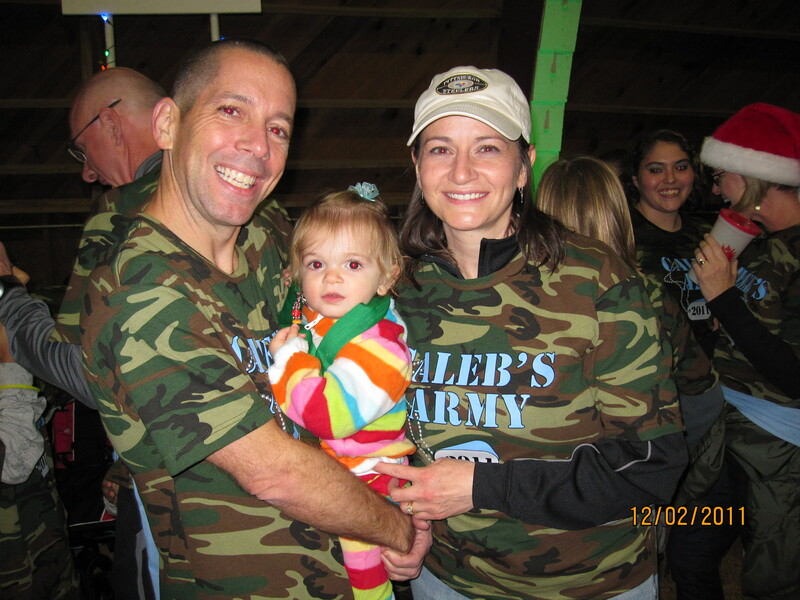 When Dawn told me that our friends Bea and Jay were going to be organizing a team to race and raise money as part of “Caleb’s Army”– it was something that we both knew that we just had to do. Caleb since he was born has gone through more struggles than many of us will go through in our lives – and he’s not even one yet. Bea, Jay and their three children made their way to Cincinnati for Caleb’s latest surgeries and stayed in the Ronald McDonald house there during his treatment and recovery. The Ronald McDonald house made a tremendous difference in their lives and made a very difficult time for them a little less difficult. That to me is what philanthropy and “help” really is about. It is basically how this entire Run for Dom got started and why today we have almost 100,000 visitors to the blog. It’s how more than $37,000 was raised to benefit Dom’s wife Val and their children Sierra and Nico and now it was why we would be racing for Caleb. To help raise awareness, support close friends who needed us and to hopefully make a difference in the lives of others. There was a race to be run of course, but I couldn’t help but think we had won just by showing up. After seeing the group of more than 40 people in their Caleb’s Army Shirts it became very clear to me what my goals for the race were. Go out, run hard and enjoy yourself. Tonight really doesn’t have anything to do with you. It’s all about little Caleb. Pre-Race: Landry and I picked up Dawn at her office and made the way over to the race location at the Mueller Hanger by the Ronald McDonald House and Dell Children’s Hospital. It was wet, rainy and windy – but it really didn’t seem to dampen anyone’s spirits. I had raced in far, far worse. 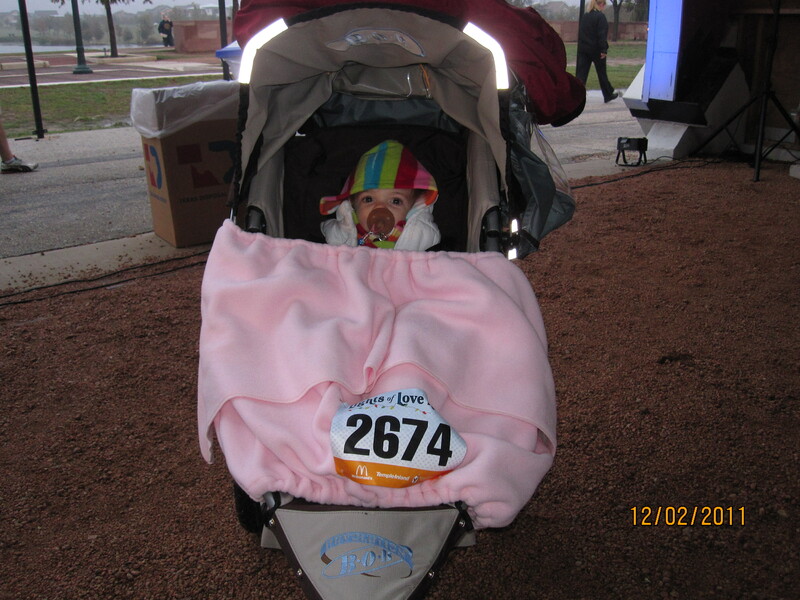 We got Landry situated in her jogging stroller as she and Dawn would be participating in the Kids 1K. Landry’s first race. We had hoped that Landry would walk some or most of it, but the wet streets, large crowd, cold weather and wind were exactly what her “Bob”stroller was for. So Landry would ride along as Dawn pushed her with the group from Team Caleb. We met up with Bea, Jay and their kids under the hangar as the group assembled. We chatted a bit about the race and took a lot of photos with the group. 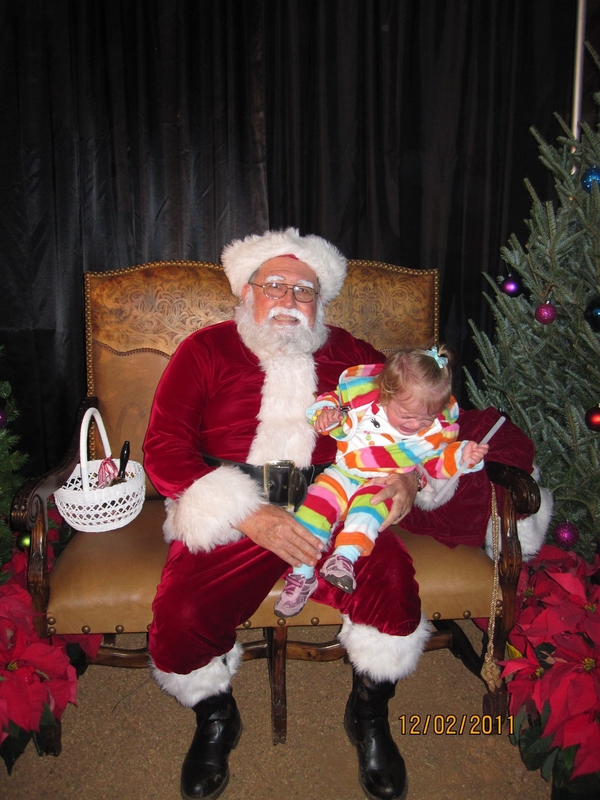 Landry even got a chance to sit on Santa’s lap and tell him about her Christmas list … that didn’t go exactly as we had planned. Get me off! Get me off! As the triple stroller that Bea uses to push the kids was readied with a large sign and lights, I snuck out for a quick 1.5 mile warm-up. I had no idea where the course went, if it was flat or hilly, what my race strategy would be, I was just going to run. So much for pre-race planning. 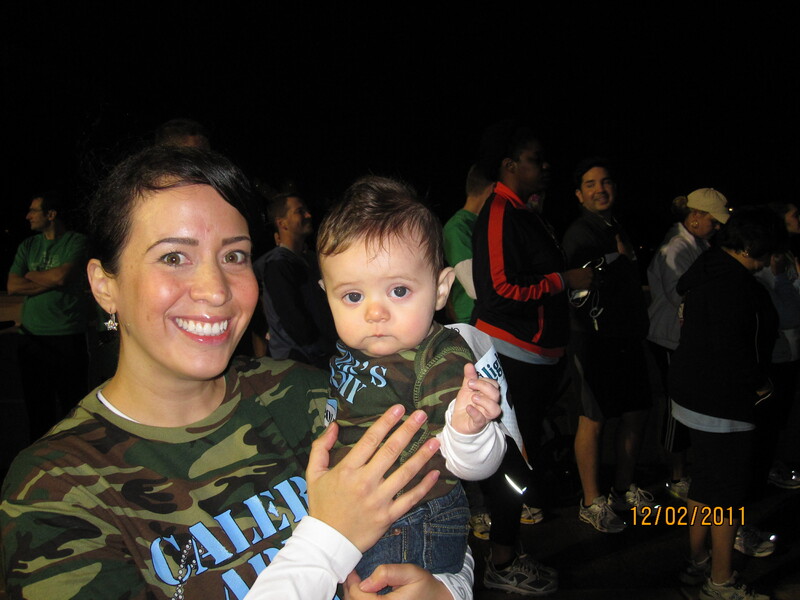 Kids K: Dawn and Landry got situated with the rest of Caleb’s Army and took off on their 1K race. About a half-mile in length they were off with the large group went out on the course, made their turn back toward home and came back through the chute in just a little over 7 minutes. Pretty impressive for a 15 month old. 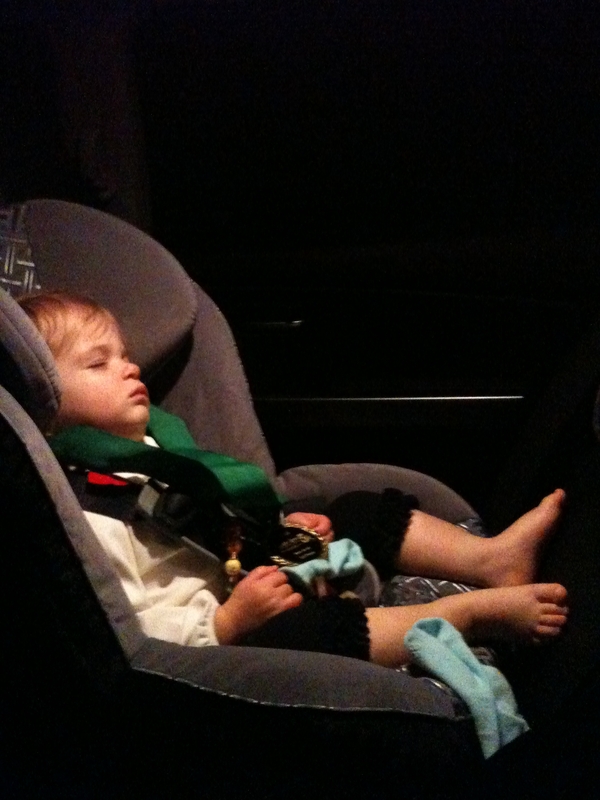 Landry’s full race report will be up later this week. You definitely won’t want to miss that. There were about 15 minutes to go before the 5K when they returned, I gave them both a congratulatory hug and kiss and went out to finish up my warm-up. I was the only runner out on the course and realized just how dark it had gotten. The light on my GPS watch has been “out” for well over a year now. There was no way I was going to be able to see my watch or my timing splits on the course. Just like the NYC Marathon, we’d be running this one blind again. No worries, we’ll just lock it in and run our 5K slightly “uncomfortable” pace for the first two miles, start to push over mile three and kick to the end. That’s the thing about the 5K it’s not rocket science. Go as hard as you can as long as you can, then hang on to the finish. The Start: I was chatting with Felix who I have seen at a few local events over the past couple of years about the course and his running of late. Seemed like he and I would be running a similar pace. There were a few younger, fast runners in the starting corral and a few other older runners who had “the look”– as in, I’m here to race tonight. The rest of the crowd which was very large were there more for the experience than anything else. As is always the case there were a dozen or so 6-10 year olds who wanted to be at the front of the line for the starting gun – very dangerous of course, especially at night, where the faster runners would have to be very careful not to trample right over them. I asked a few of the young kids to slide slightly to the left and the guys who were up front to race decided we would run out on the right side of the start basically 2X2 to make sure nobody tripped and fell. Mile 1: Our local race announcer Robert “Evil” Evilsizer gave his “runners to your marks” …. Horn start and we were off. I love seeing Evil at the local events, I must have heard that start over a dozen times this year. I shot out quickly and made the right turn onto the course around the traffic circle to let the rest of the runners who were trying to get out clean have some room on the course. It was the first mile of a 5K I had raced since August 13th, my legs felt great, but I had no idea where we were on pace. Without any light to look at my watch I decided just to settle in and run a quick-paced opening mile. I would use Mile 2 to start to meter out my energy over the remaining distance and lock in to what our race pace should be. I was hoping to run something in the 18:30 range, but really wasn’t sure how our legs would respond to this speed work after the New York City Marathon 5 weeks earlier. A few of the younger runners flew by on my left at the 1/2 mile mark and we settled into 6th place over the first mile. When we made it to the first mile marker we had turned in an opening mile of 5:43, just about perfect, although I had no way of knowing that on the course. Mile 2: At the start of mile 2 I settled in and backed off pace a bit, hoping to be running somewhere around 6:05-6:10 pace. It felt right, but again, I really had no idea. A runner came by my right side and slid past pushing us back to 7th place. he did not “drop” us, just stayed 10-15 yards ahead over the next 1/2 mile. I felt like he would be the runner to chase down and pass over the closing mile. I tucked in and stayed right where I was. Just as we were nearing the end of mile two I started to smell something familiar, but at first I couldn’t really place it, then as I got closer to the left turn and the tent where the aroma was coming from it became clear. Draft Beer. As we flew past the house with the unsanctioned, unofficial “beer tent” I yelled over, “I’ll be back!” and they all laughed and told me to be sure to come back after the race. Mile two would come in right at 6:10 pace. Just one mile to go. Mile 3 – The Finish: This part of the course featured some switchbacks as we made our way through the neighborhood and back toward the finish area. I lost track of which direction we were heading a few times and really couldn’t tell how much further we had to go. I pulled alongside the runner in 6th position and passed him on my left. I could not hear any feet behind us, so it appeared we were solid in 6th place. There was a younger runner up ahead who was on the cross-country team of his high-school. I had an outside shot of chasing him down over the final 1/2 mile so I let the legs click over a little bit faster. As we approached the 3-mile sign I had closed within a few strides of 5th place, but as soon as he heard me on his heels he dropped into a faster “young man’s” gear and I couldn’t quite catch up. As we made the final turn I finished right on his heels just :01 out of 5th place. Our last mile turned out at 6:04 pace. Amazingly we had finished just :07 seconds off of our 5K PR without ever having looked at our watch. New York City Marathon recovery = complete. Back to the course: I came through the chute and met up with Dawn and Landry. Got a bottle of water, put on my Caleb’s Army T-shirt and after chatting with my girls for a bit, jogged back out onto the course for my cool-down. I wanted to catch up with Bea, Jay, Caleb and the rest of Caleb’s Army and run in with the rest of the group. My cool-down jog took me back out into the sea of runners, knowing that I would be able to see the large illumniated Caleb’s Army triple stroller on my way. I made it to the “beer tent”, grabbed a quick beverage and caught up with Bea and the rest of the group. I chatted with everyone on the way in, including a nice long chat with Caleb’s pediatrician/runner who will be running the 3M half-marathon in a few weeks. The group was having a lot of fun and with about 1/4 mile to go we ran into Dawn and Landry – all of us making it back to the finish line for the second time of the night. We made it back in time for the awards ceremony where Landry got a chance to meet Ronald McDonald himself – the Master of Ceremonies, and she got Dad’s AG medal. It was a lot of fun for sure, the best part is the fact that Caleb’s Army was the number one fundraising team finishing with $5,378 dollars raised to make a difference in the lives of those less fortunate. The number one fundraiser on Team Caleb? Landry Marruchella who raised $600. She pretty much thumped her Dad ($378). That’s o.k. Landry, I can live with that, you are of course far, far cuter than your Daddy. Pretty soon, he won’t even be faster than you are anymore …. then what the heck is he going to do? Loved reading this post this morning. 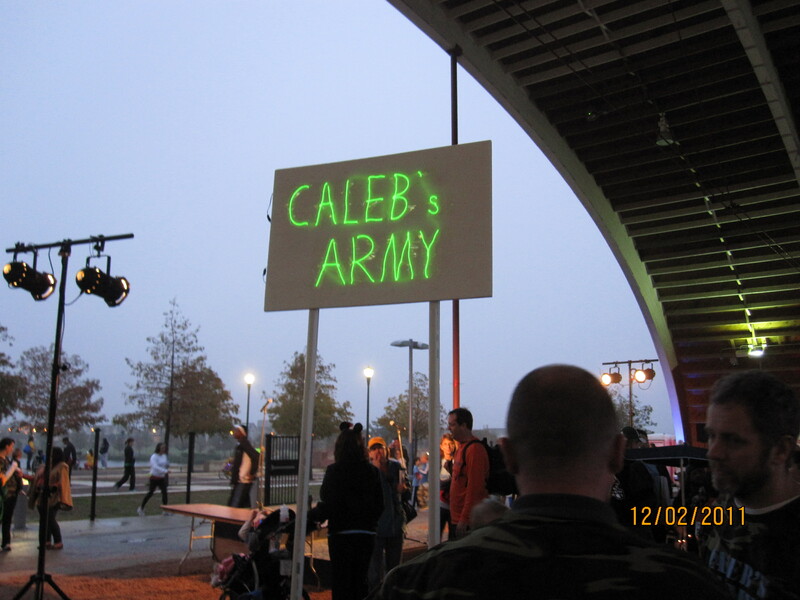 We are thrilled that you had such a good time at the Lights of Love 5K and were part of the amazing team, Caleb’s Army. They really are what this is all about. Thank you for running, having a great time, fundraising, and sharing the entire experience here. Jan – thank you for the message and thank you for all that you do at RMHC – you guys absolutely are the greatest. See you again next year for sure! How fun! 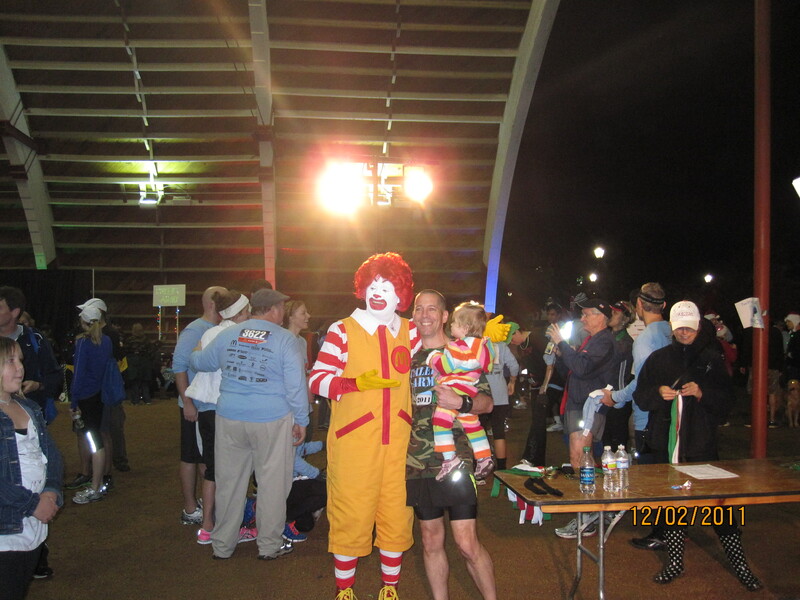 Congrats to you for winning your age group and for all you’e done for the Ronald McDonald House through your support of Caleb’s Army. Your support and Landry’s webpage were so fun to see and inspiring for many others!! Thanks and happy holidays! Oh I love reading these posts. Great running, great reason to fun. And Landry is beautiful…what a great family the three of you are together! Love it! This is what it’s all about. You’re not always handed the easiest path in life- that’s why we have each other- to help each other, to push each other, to get to the finish and say we had a great time getting there. So glad you all had a great night, great race & we hope you’ll be a part of our new tradition. Just thinking of Caleb & Landry next year at the race- that alone gives me hope that we’ll get through this ok.
Bea – it was such a great time Friday night and really a great reminder about family, friendship, love and compassion. Couldn’t wrap up the “race season” on a better note at all – we will absolutely be there again next year – I can only imagine how big Caleb will be and how big his “Army” will be by then.